These nets are credited with nearly 70% of malaria cases prevented since 2000. But despite this progress, the disease continues to kill, and experts believe creative ideas are needed to help those who remain unprotected -- especially when they're away from home. "What's going to happen is that you have round-the-clock protection," said Fredros Okumu, director of science at the Ifakara Health Institute in Tanzania, where more than 4 million cases of malaria were reported in 2015. "Repellent can be fitted on your wall ... on a floor mat ... their chair ... sandals." Okumu's team is making this wide range of goods mosquito-free by fitting them with a bespoke fabric coated with mosquito repellent and targeting objects people can't live without, making their use inherent. The repellents are volatile in nature, meaning they easily evaporate and can be detected from greater distances than ones that typically sit on your skin. Prototypes of the fabric on a chair have shown protection for up to six months, according to Okumu. But the strategy gets more complex. Rather than simply divert the mosquitoes onto someone else's skin, Okumu wants to capture them using a mosquito landing box, which mimics human odor to lure the bugs. "We're able to capture them," he said. "And this way, we are providing protection to whoever is using this facility ... (and) communal protection to everyone else." So far, most attention has been given to the chair, on which Velcro is used to attach repellent fabric to the underside, providing protection while avoiding direct contact with a user's skin -- an important point given the strength of the insecticides. But Okumu believes that other furnishings and everyday items, such as footwear, can incorporate this material and enable people to be protected wherever they go -- and easily. "People might be very poor ... but one thing that is almost universal is that they always wear some form of footwear," he said, adding that this can ensure maximum compliance. "This is part of our evolution." When it comes to disease control, however, human behavior is a major barrier. "The issue is whether people will use it or buy it," said Flaminia Catteruccia, assistant professor of immunology and infectious disease at the Harvard T.H. Chan School of Public Health. "Something for long-term use has to also be thoroughly tested" for side effects. Would you use the chair or wear the sandals? Okumu believes you would. "The fight against malaria is so difficult, we'll need all tools," Catteruccia added. "It's important to explore methods ... at the community or village level, these may be effective." Among those exploring multiple approaches to mosquito control are students in the graduate program and researchers at the Johns Hopkins Center for Bioengineering Innovation and Design. During a "Zika hackathon" competition last year, they were challenged to come up with creative ways to fight the Zika epidemic, with a focus on the mosquitoes spreading the virus. "For a large part of the planet, mosquito disease remains a huge problem," said Dr. Soumyadipta Acharya, director of the Johns Hopkins graduate program. "New thinking is needed from various angles." A key area given attention was catching people during their daily activities -- such as washing. In contrast to long-lasting, volatile insecticides that could harm your skin, an opposite group of compounds is shorter-lived and residual, meaning they can comfortably reside on your skin. Acharya's team is trying one of these, permethrin, in soap. "There are different insecticides for different uses," he said. "(This one) stays behind on the skin, as all soaps do as well." The teams at Johns Hopkins are not the first to develop anti-mosquito soaps. Last year, another repellent-based product -- known as Faso soap -- began development in Burkina Faso after the researchers behind it won the Global Social Venture Competition at the University of California, Berkeley and received funding to develop it further. But both versions are still in early development and face multiple challenges before being allowed onto the market. "There are many tests needed to evaluate the safety and efficacy," Acharya said, adding that teams also need to figure out how long a soap's effects last: It should be at least 24 hours, before a person would wash again. Catteruccia added that soap will provide very personal protection and not have "benefits at the community level," she said. "Mosquitoes are also highly resilient, so they will always be able to get round this." Insecticide resistance has been a challenge for health teams around the world. According to the World Health Organization, 60 of 96 countries where malaria is endemic have reported resistance since 2010. But Acharya is hopeful that a soap, if proven effective, could be used along with other approaches to help protect people wherever they go. His teams are also working on banners to be hung near homes that emit repellents, as well as traps with real-time sensors to monitor mosquito numbers in a community and alert residents to protect themselves when spikes occur. The traps were piloted in Brazil earlier this year. 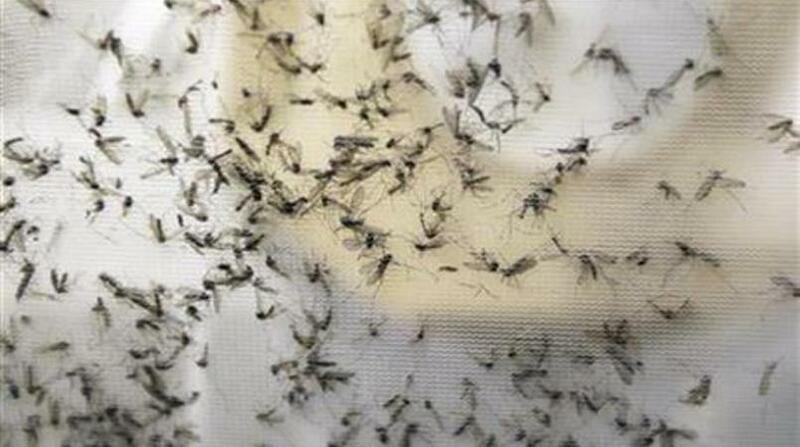 "It's going to be a multipronged approach," Acharya said, highlighting that soaps, sprays, banners, traps and more can work together to keep mosquitoes at arm's length. "Together, your odds of getting bitten are reduced." "It's about what people will accept," said Logan, whose teams regularly speak to people in affected communities to learn which products they're most likely to use. One prototype recently trialed in Thailand was a school uniform laced with the insecticide permethrin to prevent infections from dengue. More than 1,800 students were enrolled from 10 schools, with five schools using the new product and the other five monitored as a control group. The number of mosquitoes caught inside classrooms of students wearing the treated uniforms was significantly reduced in the month after their introduction. The challenge, however, was making the effect last. The uniforms' ability to knock down mosquitoes fell dramatically after four washes. "That study was encouraging," said Logan, who is preparing prototypes of a wider range of products: general clothing, footwear, jewelry and detergents. "It's important you target your demographic," he added. "And we need to understand the diversity of everyday lives." His team are now also developing more natural repellants, based on human odor, to incorporate into their product range. By creating diverse good for people to choose from, Logan hopes these protective products will be "relevant anywhere in the world," to overcome the barrier of human compliance. "It's always going to be a combination of different interventions taken to communities," he said. "Wearable technologies won't eliminate malaria on their own, but they will help."